I’ll start by saying I am a big fan of realistic fiction, and a really big fan of books set in small hard luck towns. 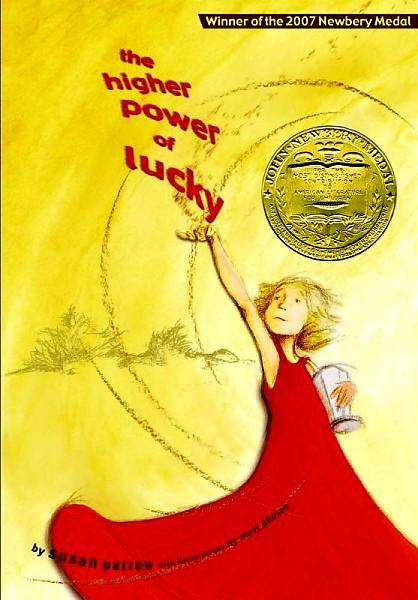 So the fact that Lucky lives in a town with only 42 people in it, where the majority of those people attend multiple twelve-step programs predisposed me to loving the book before I even really got into the story.But even beyond just the appealing set-up, there’s lots to like about Lucky. She’s scientifically minded and unafraid of bugs and snakes. She’s kindhearted at the core, but has flaws, including her exasperation with her clingy five-year-old neighbor Miles, and her underlying suspicion that Brigitte, her guardian, is secretly planning an escape. Lucky also eavesdrops on twelve step program meetings, looking for hints on how to find her higher power, and, still mourning the accidental death of her mother, maintains a survival backpack, filled with everything a person would need in case of emergency. She doesn’t quite trust her new life without her mother, and copes by being constantly prepared for the next disaster to strike. I think what truly won me over about this book was the writing itself, and the amazingly detailed characterization of each person, and of the town of Hard Pan. There are lots of books out there where kids have to overcome some obstacle in order to grow and change and become more mature, but I don’t think many of them are written this well, or with this same style. Lincoln did something brilliant. Next to SLOW, he drew two neat perfect-size dots, one like a period and the other a little above it. Lucky knew it was a colon and it made the sign mean, "You must drive slow. There are children at play" (p. 24). I also loved the little things, like the phrase “brain crevices,” and the fact that Lucky’s dog’s name is HMS Beagle. I enjoyed the stories Lucky tells Miles about Chesterfield the Burro in the Olden Days of Hard Pan, and Short Sammy’s efforts to cook with government cheese, about which he says, “...nobody can figure out what to do with it to make it something you’d want to eat.” Best of all is Brigitte’s exclamation of “Oh, la-la, la-LA, la-LA, la-LA” whenever her anxiety or anger level rises. So many very specific details went into Susan Patron’s portrayal of Hard Pan and its people, and I eagerly ate up every single one. One final bonus was the references to other children’s books, namely Are You My Mother? by P.D. Eastman, and Peter Sis’s The Tree of Life. I especially love the fact that the author took the time to cite them in the acknowledgments, along with the serenity prayer, which most young readers would probably not know on their own.